Is it better to spend £3 on a bacon sandwich or a pint of beer? Or to spend £2,000 on a holiday in the Seychelles rather than fix a leaky roof? As consumers we are usually very able to decide which option offers the better return on our investment – and often those returns will be improvements to our quality of life. Valuing the what are known as the “affective consequences” – that is, the consequences which relate to our feelings and attitudes – of consumption decisions like this allows both individuals and policy makers to work out how best to spend limited resources to maximise quality of life. Putting a price on something means we have a convenient way of comparing value across very different experiences and initiatives. When it comes to drinking alcohol, however, working out the cost of consumption is a little trickier than weighing the benefits one might get from a holiday or home improvement. It is fairly straightforward to measure how much it costs taxpayers to treat people for alcohol-related illness and injury. In total, alcohol-related harm is estimated to cost NHS England alone about £3.5 billion every year. So, we have a situation where we understand the cost to the health services of excess alcohol consumption, but we do not understand the affective costs of alcohol consumption. How do we place a value on something so nebulous as depression? This was the point of our newly published study and the idea is relatively simple. We know that those with a higher household income are happier. We also know that certain events make people unhappy. So we can ask how much we would need to increase someone’s household income to offset the misery they experience due to specific events. For our recently published paper we developed methods to quantify the affective consequences of alcohol consumption using UK Biobank data. We looked at 243,133 individuals between the ages of 40 and 70 who drank alcohol in varying amounts. We did not consider the short-lived euphoria associated with drinking, we were only interested in the long-term consequences. If depression is greater in heavy alcohol users compared to moderate alcohol users, and depression decreases as household income increases, we can work out the increase in household income needed to offset the increase in depression due to an increase in alcohol. In other words, we can place a value on the depression associated with alcohol use. We looked at average grams of alcohol consumed each day, and our measure of income was annual household income. On average we estimated that for each additional gram of alcohol consumed each day, annual household income would need to increase by about £210 to offset the increase in depression. This means that the increase in depression associated with drinking a bottle of wine each week could be eliminated by increasing annual household income by £2,400. 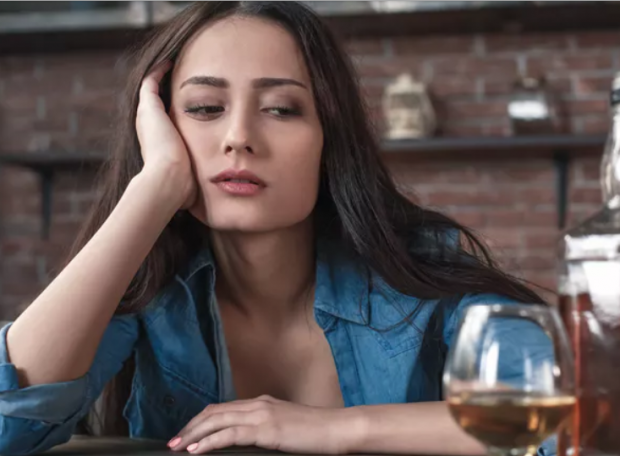 These results on the relationship between alcohol and depression also replicate similar studies showing that depression increases as alcohol use increases. However, the method we have developed is probably most useful to those interested in the costs and benefits of initiatives designed to reduce consumption, such as health researchers and those in the NHS. Of course, our work has limitations. We did not, for example, test the causal relationship between alcohol and depression. It is quite possible that the association we found between alcohol and depression can be explained by other factors. I welcome criticism that helps us develop these methods and helps the scientific community develop to better capture the true costs of alcohol.